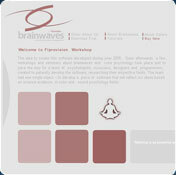 Brainwaves Rainbow comprises brain wave sound frequencies, basic colors psychology, nature and background sounds. These elements are pre-combined in typical example presets for users to realize how infinitely customizable this software is. Optionally, users can embed subliminal messages to chosen elements (subliminal messages are not pre-installed in presets). This software allows you to upload your favorite tunes or sound samples and combine them with our elements. Your creation can then easily be recorded and exported to your iPod or other Mp3 player. Integrated countdown timer resets presets and shuts down all playing sounds when set. Develop your creativity, innovativeness, intuition, patience, concentration and focus by simply using this creatively designed software. Creating this program we intently avoided using photos and videos in order to make users visualize their own natural surroundings images, without our suggestions. This program is aimed at artists, students, those who can’t find enough time to spend on themselves and nature, those who spend hours in front of their computer displays, for spa and massage therapy centers, theaters… Use our relaxing sounds to enrich your living space and offices, or listen to it on the go using your Mp3 player. You cannot download any crack or serial number for Brainwaves Rainbow on this page. Every software that you are able to download on our site is legal. There is no crack, serial number, hack or activation key for Brainwaves Rainbow present here. Our collection also doesn't contain any keygens, because keygen programs are being used in illegal ways which we do not support. All software that you can find here is freely downloadable and legal. Brainwaves Rainbow installation package is prepared to be downloaded from our fast download servers. It is checked for possible viruses and is proven to be 100% clean and safe. Various leading antiviruses have been used to test Brainwaves Rainbow, if it contains any viruses. No infections have been found and downloading Brainwaves Rainbow is completelly problem free because of that reason. Our experts on malware detection tested Brainwaves Rainbow with various spyware and malware detection programs, including fyxm.net custom malware and spyware detection, and absolutelly no malware or spyware was found in Brainwaves Rainbow. All software that you can find on our servers, including Brainwaves Rainbow, is either freeware, shareware or open-source, some of the software packages are demo, trial or patch versions and if possible (public domain licence), we also host official full versions of software. Because we want to be one of the fastest download sites on the web, we host all the software including Brainwaves Rainbow on our servers. You cannot find here any torrents or download links that would lead you to dangerous sites.